At each level of cub scouts, your scout will be challenged appropriately. Here are the programs your scout will expect to experience as s/he rises through the ranks. The Bobcat rank is the entry-level rank for all cub scouts. The Tiger Cub group is for boys who are in 1st grade or are 7 years old. In the Tigers program, an Adult Partner (a parent, grandparent, or other guardian) always accompanies each scout. The Tigers and an Adult Partner form a team. The first few Tiger meetings are organized and run by the Tiger Den Leader in order to introduce the Tigers and Adult Partners to Scouting. After that, each Tiger/Adult team selects a topic from the Tiger book and presents the topic to the Tiger Group (one topic per meeting). The Tiger earns progress beads towards their Tiger badge. Completion of this badge earns the right for the Scout to wear the Tiger patch on their uniform (in the six o’clock position of the front left shirt pocket, directly beneath the Bobcat patch). At the end of the Scout year (in May), Tigers graduate into a Wolf den. In the Wolf program, completion of achievements in the Wolf handbook leads to earning the Wolf badge and Arrow Points (for extra activities). Arrow Points can be worked on during the entire year, but cannot be awarded until the Wolf badge has been earned. The Wolf handbook includes many activities that are family oriented. Your child will need your assistance to earn this rank. Completion of this badge earns the right for the Scout to wear the Wolf patch on his uniform (in the nine o’clock position of the front left shirt pocket) and the right to earn Arrow Points. Arrow points are worn under the Wolf patch (see the section on placement of emblems and insignia near the end of the handbook). The first Arrow Point earned as a Wolf is gold, all others are silver. The Bears are boys which are in 3rd grade or are 9 years old. 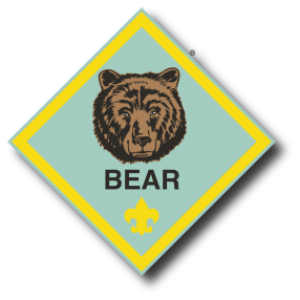 In the Bear program, completion of achievements in the Bear handbook leads to earning the Bear badge (and Arrow Points for extra activities). Arrow Points can be worked on during the entire year, but cannot be awarded until the Bear badge has been earned. The Bear handbook includes many activities that are family oriented. Your scout will need your assistance to earn this rank. Completion of this badge earns the right for the Scout to wear the Bear patch on his uniform (in the three o’clock position of the front left shirt pocket) and the right to earn Arrow Points. Arrow points are worn under the Bear patch (see the section on placement of emblems and insignia near the end of the handbook). The first Arrow Point earned as a Bear is gold, all others are silver. At the end of the Scout year (in May), Bears graduate into a WEBELOS den. The Webelos track is for 4th-5th grade boys in the 10-11 age range. The WEBELOS program (and there is always an S at the end of WEBELOS) is designed to transition the scouts from Cub Scouts to Boy Scouts. In the Webelos program, scouts earn activity pins in areas such as geology, scholarship, fitness, and outdoorsmanship that count towards the Webelos rank. As such it’s really broken into two phases, based upon the rank badge being earned. In the First-Year Webelos program, the boys work on their Webelos badge. Additional achievements beyond the Webelos badge earn the Compass Emblem and “Compass Points”. The focus of the Webelos den is to work together as a team, much like a Boy Scout Patrol. This includes Webelos den camping.